The former GOP presidential candidate has met with hundreds of business owners in swing states, urging them to influence their employees to vote Republican. 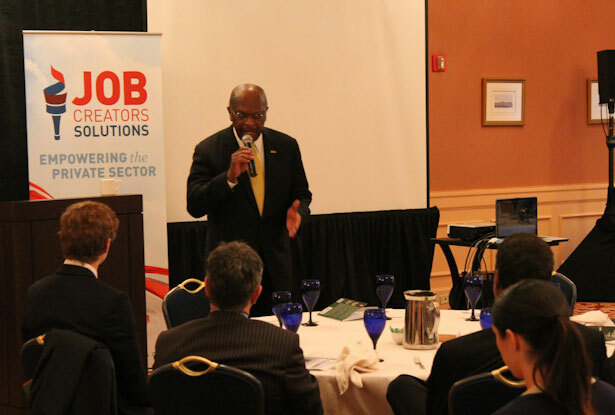 Herman Cain addresses small business owners in Philadelphia on Friday, October 19. Photo by George Zornick. These are boilerplate attacks from Cain, but this was not a typical Tea Party rally. This was yet another stop on Cain’s “Job Creators Truth Tour 2012,” the fifth this week and one of thirty that will happen before the election. The audience was “job creators” from the Philadelphia area—small-business owners who were there to learn how to influence their employees vote in November. Mitt Romney landed in hot water this week when In These Times reported his remarks on a conference call with the National Federation of Independent Businesses, in which he told business owners that “I hope you make it very clear to your employees what you believe is in the best interest of your enterprise and therefore their job and their future in the upcoming elections.” But Cain’s tour represents a much deeper and well-organized effort by the GOP to use what borders on workplace intimidation to influence this fall’s vote—and one that has largely gone on below the radar. Before each event, which are happening exclusively in swing states, invites go out to business owners through local Tea Party groups. The lunches are always free, and during nice meals business owners are plied with information about how President Obama’s re-election will supposedly damage their bottom lines. They are also given multiple pamphlets containing similar information, and instructed to pass them out to employees. Cain said he has already made contact with 1,600 small business owners since beginning the tour. Unlike Romney, who used a bit of tact on that conference call (saying employees should vote “whether you agree with me or you agree with President Obama,”) the materials and speeches leave little doubt about who employees are supposed to vote for. There are occasional disclaimers that this is a nonpartisan exercise, but they border on nonsensical. “This is not a party stance. The mission is to defeat Barack Obama,” Cain said Friday in Philadelphia. In case the materials aren’t clear enough, the speeches at the lunches are blunt. Tea Party leaders often speak, like Colin Hanna on Friday afternoon—he told the crowd that Obama “simply does not understand growth.” Wall Street Journal columnist Stephen Moore was also there, and gave a mini-lecture about how Obama’s economic policies are supposedly going to wreck the economy in a second term. He also co-authored a briefing book called “Prosperity 101” distributed at the luncheon that employers are also instructed to hand out to employees. The tour is funded by the Job Creator Action Fund, a 501(c)(4) that doesn’t disclose donors. It was created after the GOP primary by Cain and Bernie Marcus, a billionaire co-founder of Home Depot and conservative activist. Hansen said all the materials had been cleared with Federal Election Commission and National Labor Relations Board Lawyers, and do not break the law. 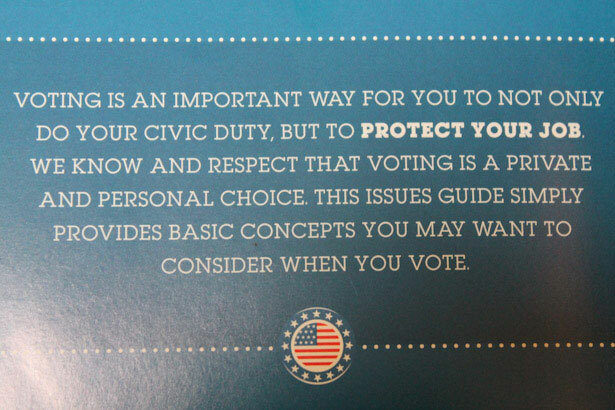 That may be true—the Citizens United decision made it legal for employers to subject employees to partisan, one-sided political speeches or information—though they are still barred from making implicit or explicit threats about voting for the “wrong” candidate, which some of these materials seem to flirt with doing. For more on employers pressuring voters to vote Republican, check out Lee Fang's report, Is Your Boss Going to 'Mine' Your Vote?